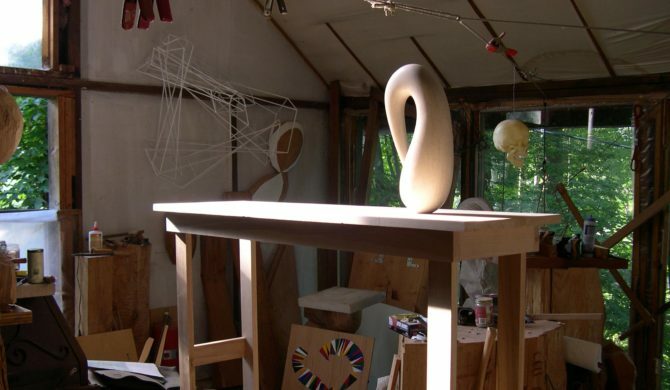 Reception: Friday, March 1, 2019 | 5:00 – 9:00 p.m.
Mike Slaski began his studio practice in 1973, and his multidisciplinary approach includes drawing, painting, sculpture and installation. He received his M.F.A. from the University of Chicago in 1982. He has exhibited in Chicago, IL; Indianapolis, IN; Kalamazoo, MI; and Detroit, MI; among others. He and his wife Ruth Andrews live in Cassopolis, Michigan. I am committed to art, not as a life style or ideal, but for the fascination in making objects to incorporate history or systems or meaning, to expand my potential and acknowledge my limitations. The most satisfying aspect is to look at the object to see if it is finished. Some work requires an audience; the aesthetic is completed with some literary acumen. A “work of art” is a philosophical, as well as a material endeavor and points to a universe of intelligence. The web site for his work can be visited at mikeslaskiartist.com.